If you use internet banking, you use SSL. It’s the little lock icon in the address bar. Sometimes the address turns green. That is telling you that this site is secure and any information you share with the website is encrypted and sent in a secure transmission layer. Without it your information is not encrypted. This is legitimate and comes about because of a security breach that occurred in 2012. 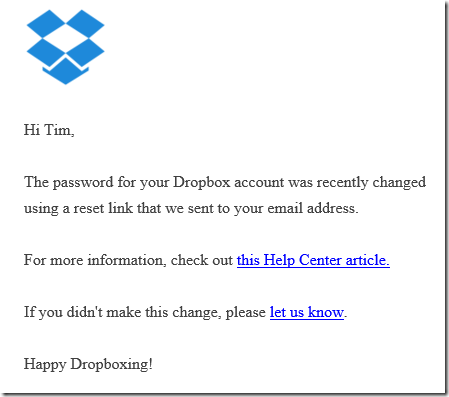 There is no indication that individual users have had their dropbox data compromised. 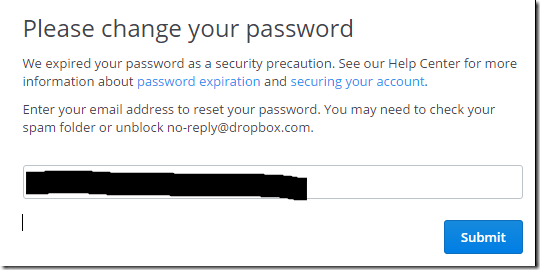 Dropbox has this official notification about the password reset request. 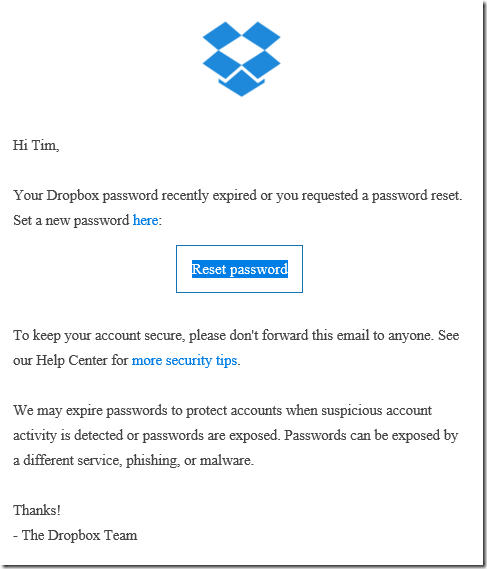 In addition a number of security agencies are reporting the news of the dropbox password reset. 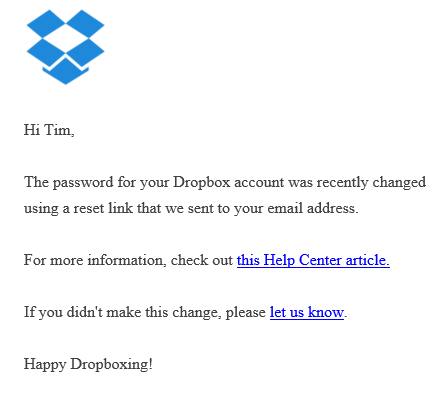 Even though it is an email that comes from Dropbox we would suggest that you go directly to http://dropbox.com – sign out if already signed in. Once you go to sign in you will see this screen. Once you enter your email address and hit Submit you will receive an email with the reset link. After resetting your password you should also receive this confirmation email. You will also need to sign back in on any other devices like mobile phones or tablets etc. Who is Your Trusted IT Advisor? We act as a trusted advisor for many of our clients. What does that mean exactly? Most business owners understand the importance of including their accountant and lawyer in any business changes that have legal or tax implications. It is very important to ensure that the right structures are in place to minimise tax, meet legal obligations and ensure that liability and risk are minimised and managed. It is equally important to seek the advice of a trusted IT advisor in the same instances. An advisor sits on your side of the table, seeks to understand your business and can then make suggestions that are your in best interest. Here are some of the many reasons why this is important. · Adding or terminating staff or employees should be done correctly. Ensuring they have the right hardware, software and access to corporate systems and data before they start work eliminates up front teething problems and gets them up to speed right away. Ensuring an employee’s access is removed BEFORE terminating reduces the risk of data theft and malicious behaviour. Technology can be configured many different ways, and what could be right for one scenario might not be right for another. Starting a new business, opening a new store, or even just working from home might require different security, backup solutions and data storage solutions. It is best to define these and understand the cost of implementation before the decision is made. Technology replacement plans should be in place to cycle hardware every few years. These may need to be modified if changes in ownership, downsizing or scaling up are planned. So before you make important business decisions, contact us for a no obligation free chat. We would love to be your Trusted IT Advisor. David Koch from Channel 7 presented a small business makeover series with Microsoft last year. The 4 part series takes approximately 40 minutes to watch and is well worth the time taken. If your business can relate to any of the problems presented here, or would like any of the solutions then please call us. This is what we do! Using technology correctly can improve workers productivity and business efficiency. Being able to do things for your customers your competitors can’t do may just give you the edge! Are you running the latest version of Windows 10 yet? You can work it out by hitting the start button and typing System and clicking System Information. In the OS Version you should see 10.0.10586 Build 10586. If not, you are running an older version. You can update by running Windows updates and ensuring it downloads this new version. Note: Check with us if you are not sure, or want support to running this version update. And if you are running Windows 7 or 8 then time to upgrade – you have 3 months left for the free upgrade. Book us in to upgrade your business or Home PCS to Windows 10 now - $150 per machine. conditions apply. Security is an ongoing battle of threats and defence. The cost to businesses to remove malware and viruses is a lot more than the small cost of educating yourself and taking appropriate defensive measures. Are you up to date with the latest threats? Three types of malware you should know about in 2016 Have you heard of the Brain Test, Zeus or Conficker threats? Are you safe? Read this article to learn more. Who is most at risk of identity theft? You might be surprised to find out just who is more at risk of identity theft. Read this article to learn more. Or read our previous articles about protecting yourself and your business’s data. If it asks for your personal information, play it safe and assume it is a phishing attack. If you believe the email may be a scam, phone the organisation to verify if it is an official email. If you do click on a link, make sure to never enter your information into the website that appears. If you recognise the email address, do not take this as proof it is from an official or authentic source. If you see a suspect email has an attachment, make sure you do not open or download it as it could be an infectious computer virus. Christmas is almost here – and that brings great opportunities in business. People are shopping, using your business services and hopefully hitting your website and social media. Do you have a plan to engage and attract customers in this holiday season? Are you sure your website is secure? And if you are shopping yourself are you sure your personal data is secure? We would love to help with any of these things. Can you be sure your personal data is secure? The Veda 2015 Cyber Fraud Report published in October has some alarming statistics. Sydney, Australia: Wednesday, 7 October 2015 – Australians’ love of online commerce and sharing on social media is making us unwitting pawns in the global fraud marketplace. A new fraud report released today reveals that fraudulent credit applications involving identity takeovers in Australia rose 59% in the past two years – and 17% in the past 12 months. It shows that the online playground for hackers is getting serious, with 50% of credit application fraud in Australia now occurring online – an increase of 33% compared to the previous financial year. This compares with a 23% fall in credit application fraud incidents occurring at bank branches in 2014-15, compared to 2013-14. The good news is that most Australians now use anti-virus software (90%) and PayPal for online payments (85%). Following is a checklist to see if you or your business has exposure in any of the most obvious areas. Can you tick these items off? Passwords should be changed regularly, and if you don’t have different ones you should at least have several levels – e.g. banking, email, online social medial accounts, and they should not be the same! WiFi passwords are secure and your WiFi network is locked against casual users. If you use someone else’s computer to conduct any banking use a private session and close the browser afterwards. Physical devices should be reliable, secure and access restricted to authorised personnel. Do you have a notification plan around lost or stolen data or devices with an escalation based on severity of the problem? What is the time gap between a critical piece of infrastructure failing and its replacement allowing for continued business activity? Eg Router/modem, switch, server, PC, POS terminal etc. The security of your business is important to us. We will assist you to work through the different threat levels, exposure and security risks and evaluate your current plans for failure points or missing pieces. Then we can help you plan and implement the missing pieces. Act now BEFORE you experience a breach or loss. Contact us today for a security audit of your business and get yourself peace of mind. Recent research from the Australian Competition and Consumer Commission found that phishing, hacking and ID theft was reported in over a quarter of all scams in 2014 and this is continuing to grow as more and more data is put online. Be aware of what you (and your family) share online. Ensure your kids particularly aren’t giving away information that shouldn’t be kept private or could be used to compromise you. Clear your cache regularly and use in private sessions when banking or doing other shopping. Always check that the https:// protocol is in place when shopping. The S is the important bit. Microsoft just released a major Windows update to the world. This desktop update is packed with nearly 200 new capabilities, many of which were developed directly as a result of feedback from Insiders like you. Check out Terry Myerson's blog for more details. With Windows 10 on now more than 110 million devices with 12 million of them business machines it is rapidly being installed everywhere. Talk to use about the significant advantages to your business about using Windows 10. We can upgrade you over the holiday period. Today’s newsletter has an article about your Business Security and the rest is mostly about Office 365. Most of you are using it but probably only scratching the surface with what it can do. I would love to hear back from you via this very quick survey created inside Office 365. Click this survey link. Can you be sure your business data is secure? Have you ever sat down and thought just how your business would cope if you lost all or even some of your data? Whether your critical applications are email, CRM, accounting or intellectual property the first line of defence is your IT infrastructure. And unfortunately in many cases the first point of attack is poorly planned and deployed infrastructure. If critical data is corrupted, lost or stolen then there may be drastic business consequences. Maybe the inability to locate customer’s information or data, maybe the loss of sensitive information, or maybe the inability to trade could have a serious impact on your business’s profitability or even its continued existence. Following is a checklist to see if your business has exposure in any of the most obvious areas. Can you tick these items off? Your network is secure and reliable. Mobile devices are securely connected and monitored and can be remotely wiped or deactivated. Network access is only via security protocols requiring user authentication. Your backup and restore plans are tested regularly. Does your backup plan include all your data and applications? How often are your backups scheduled? And to what media? And with what redundancy? Have you recently tested restoring your data or your systems? How far back to the past can you recover data? Is your backup onsite, offsite or a combination? So many new features, so few newsletters or time to explain them all. If you haven’t had your free business audit yet then please contact us. We will go through what you are using, show you the new features that you could be using and identify use cases where you could gain productivity or efficiency as a result. Here are just some of the new things you may not be aware of. The first apps to take advantage of the Office 365 Groups service include Outlook, OneDrive for Business, OneNote, Skype for Business, Power BI and Dynamics CRM. Yammer, Delve and Planner will also soon take advantage of this service. With the new Outlook Groups mobile app for Windows Phone, iOS and Android, you can now engage with your group on your phone while on the go—continue conversations, view files, @mention colleagues and even discover other relevant groups. Office 365 Planner offers people a simple and highly visual way to organize teamwork. Planner makes it easy for your team to create new plans, organize and assign tasks, share files, chat about what you’re working on, and get updates on progress. Planner can be used to manage a marketing event, brainstorm new product ideas, track a school project, prepare for a customer visit, or just organize your team more effectively. How many and which tiles you see depends on what services and features are available to you as part of your Office 365 subscription. For example, suppose that you're using Office 365 Business for work, and Office 365 Home for personal use. In this case, the app launcher you see when you're signed in to Office 365 Business will look a little different than the app launcher you see when you sign in to Office 365 Home. As a reminder, mainstream support ends for Office 2010 on October 13, 2015. Office 365 is designed to work with any version of Microsoft Office in mainstream support. We encourage you to update your Office installations by uninstalling Office 2010 and installing the Office 365 ProPlus subscription. Instructions can be found at http://aka.ms/uninstalloffice2010. The new client (available for both PC and Mac) offers improved reliability and selective sync, as well as removing the 20,000 file sync limit and extending support for files up to 10GB in size. Microsoft has completely refreshed the browser experience, employing the best practices from the OneDrive consumer experience used by millions every day. The resulting browser experience is clean, intuitive and beautiful. A highlight of the new browser experience is the ability to switch between a list and preview tile view which makes it easy to identify key files. All of the key actions you want to take on a file or folder, such as preview, edit, share and delete, are conveniently located on the toolbar or by right-clicking a specific file or folder. This new browser experience makes managing your work files easier than ever. Read the link for more information including enhanced sharing, better mobile access and security. 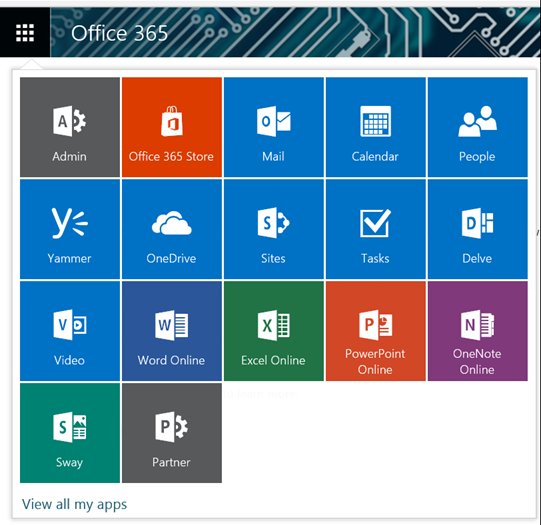 Office 2016 – have you upgraded yet?